Say goodbye to your iPhone, not your messages! 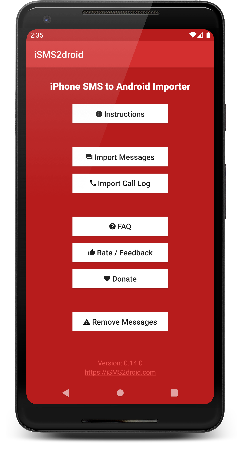 Import all your SMS texts and plain-text iMessages into your Android device, with full support for any language. Don’t need all messages by every person that ever contacted you? Just select the contacts whose messages you want, and all others will be ignored. Want to start over, but keep all messages that you already had on your phone? The “Remove Messages” feature will only remove those messages that were imported by iSMS2droid. No need to explore the complex filesystem structure of Android, just put the database onto your phone and let iSMS2droid discover it automatically. Some people still use their phone for making calls, so import your call log to check if you are one of these persons! Can’t find your databases? The app doesn’t do what it should? Get in touch and you’ll get support directly from the developer, not some 3rd-party help desk. 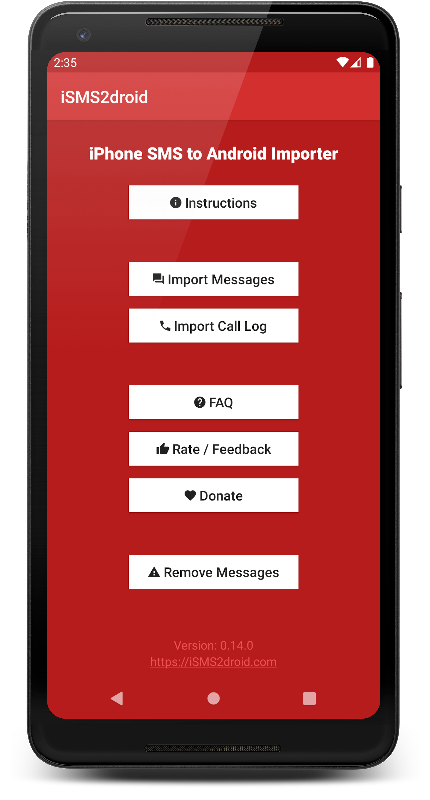 If you successfully converted your SMS and/or iMessages and feel like thanking me, consider sending a donation via PayPal by using the button below, or by using the Donate button inside the app. Where can i find my iPhone backups? Which files do i need to copy to my Android phone? If you want your call log, you need to copy the file 5a4935c78a5255723f707230a451d79c540d2741 from the folder 54. (For older iOS versions it’s called 2b2b0084a1bc3a5ac8c27afdf14afb42c61a19ca. My backup folder does not contain that file! If your backup folder does not contain the backup file of the message database, you haven’t received or sent any messages since the last time you created a backup. Please check the older backup folders, starting with the one that has the most recent timestamp at the end, and search for the file in those. and then create a new backup, which should then contain the file you need to copy. If you are using an older version of iOS, the call logs file is called 2b2b0084a1bc3a5ac8c27afdf14afb42c61a19ca. This is a very strange issue, but luckily it’s easy to fix: Just rename the database file(s) to something other than the original/suggested filenames, like MyMessagesFile. This prevents the app from finding the file automatically, so it will then ask you to select it manually – after which everything should work as expected. The app says my file is encrypted! file. Please double-check the encryption setting for your backups in iTunes, and/or do a search for the exact filename in your backup folder. Does the app support MMS or iMessage attachments? No, the app only supports the plain text body of both SMS/MMS and iMessages. For a detailed explanation, please have a look at the next question. My group messages have been split up! Android does not support group messages, so all messages from a group chats you had on your iPhone are imported like direct conversations with the respective sender/recipient. Why are there no images in my messages? a specific folder on your iPhones filesystem, and then puts the path to those attachments into a separate table in the message database. iPhone, those attachments get also backed up to your computer, but each one as a separate files with a cryptic filename that is based on the path of the file on your phone. predict which files from your backup are message attachments until iSMS2droid actually opens the message database and starts importing. would be the actual import of the messages including attachments – after you copied the additional files. Unfortunately i’m not in possesion of an iPhone anymore, so i can’t really fully develop this feature, as it would require extensive testing with real backups. My testing has shown that a good estimate for the import speed is 50 messages per second, at least on a recent (<=2 years) device. This means you should be able to import 100.000 messages in 30-45 minutes. Please keep in mind that any other activity during the import will greatly affect this number, especially any apps that use lots of memory or access the storage. Any security apps or anti-virus scanners should also be disabled during the import, as they will most likely try to inspect every single message, which will slow down the process considerably. The app crashes when i select the database file! to be working fine again, so if it’s working for you, just ignore the warning. If you are either using Samsung device with a not-so-recent Android version, or don’t use a Samsung device but the app crashes anyways, please use the Online Converter (below). A lot of messages are missing! from this database to display them. The bigger the database, the longer it takes for the messaging app to load them, and that’s why Android does something called “indexing the database”. been indexed – and that looks like there are messages missing, even if they are in the database. then check the messaging app once it has started up again. If you see at least some new messages then, give it some more time to do the indexing, don’t just reboot it again right away. Let your phone work through the database, the less you use your phone do during this process, the faster they will show up. Please see the above question, “The app crashes when i select the database file!”. Nothing happens after i select the database file! My device is not supported! anyways, as the incompatibility of iSMS2droid will be the least of your worries. If for whatever reason you absolutely must import your messages on such an old device, please use the Online Converter (below). What does the name iSMS2droid mean?